Two copyright issues have been swirling online in recent days which — despite the fact that neither of them particularly impacts genealogists — is kind of neat and kind of cool. Since both of these have been particularly called to The Legal Genealogist‘s attention,1 and since The Legal Genealogist is hardly shy about chiming in on copyright issues… here goes. The animal issue arises from a dispute between British nature photographer David Slater and Wikimedia Commons over photographs of the female Celebes crested macaque you see here illustrating this post. Since this is obviously a great photo, and it was taken in 2011, when copyright protection began automatically the minute the picture was taken, how can it possibly not be copyrighted? 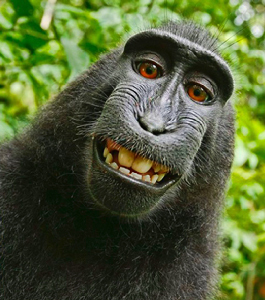 Because it was the macaque — the monkey — that took the photo. It sure looks to me like the song ought to be out of copyright by now. The evidence submitted for the company that’s suing argues that the tune was first published as “Good Morning to All” in 1893, and that the “happy birthday” lyrics were published as being sung to that tune as early as 1911. If that evidence holds up in court, then any copyright claim should be over: anything published in the United States before 1923 is out of copyright now. For now, however, the song is still under copyright and The Legal Genealogist isn’t going to sing it in a public recording for fear of getting hit with a bill for licensing fees. So… no to the animals and yes to the birthday song. Definitely neat. And definitely cool. It’s cool because the fact that both of these were circulating among genealogists for comment shows our community is interested in copyright — concerned about its impacts — curious to know what the law is. And that, in the long run, can only benefit us by helping to keep us out of trouble. Thanks as always for bringing us the issues in clear English! The photographer’s involvement in providing the equipment and in doing the post-processing is the only thing that he has to claim, Diana, and that will be at the heart of the issue. But I’m not sure how it will come out in the end. In other cases where, for example, people gave a monkey paper, art supplies etc., the end result was still considered non-copyrightable. How is a camera different? Indeed, a painting produced by an elephant is not copyrightable just because a human created the paint and the canvas. That’s the argument. We’ll see what the courts do with it. One should never underestimate the intelligence of monkeys. Someone supposedly conducted a study, many years ago, in which a chimpanzee was given pencil and an answer sheet for the GRE exam (the graduate school version of the college entrance exam) to play with. When the chimp lost interest in putting pencil to paper, the answer sheet was submitted for scoring and it turned out the chimp had managed to mark enough boxes correctly, that even after deducting the penalty designed to eliminate any advantage to be gained by guessing at the answers, the chimp still earned a positive score. Not a good enough score to get into Yale, but a score, nonetheless. The issue isn’t how smart the monkey is; it’s whether the law recognizes a copyright in an image created by the monkey. Judy, I’m not going to sing “Happy Birthday” or any other song in public either but it’s not because I’m concerned about copyright laws!!! The word “solely” seems to be key here. That’s certainly what the argument will focus on. For years I used the first situation as a hypothetical in my Copyright Law class. The students always thought that there was no copyright as there was no authorship by the camera owner and no “authorship” in the animal. And now I am going to go sing Happy Birthday! What if the monkey had not snapped the photo herself? What if the camera had taken the photos automatically the way the photographer had origianally intended? Would those photos be copyrightable? It seems to me that again, the photographer has shown no original work of authorship. The subject matter might change as various animals came and left the view, but he has done nothing to author the photos. He set the settings on the camera once, and let the camera take the photos. This assumes the photos would not be touched up or altered in some way later. Not so sure in that case, Connie, since the angle, lighting, choice of locations, etc., would all have been set by the photographer. I agree with Diana Ritchie. I think the circumstances call for the criteria for copyright to be interpreted with a reasonable modicum of pragmatism. As per your quote from the Compendium, “the term ‘authorship” implies that, for a work to be copyrightable, it must OWE ITS ORIGIN to a human being.” The word “owe” means a degree of causality. Without the intervention and creativity of the photographer, the photograph would not exist. I would regard that as sufficient to make a copyright award. As to the second part, “materials produced SOLELY by nature, by plants, or by animals are not copyrightable.” No question — the macaque did not do it himself or herself, nor “solely” with the assistance of other animals, plants or Mother Nature. There was a clear human intervention and facilitation. To my mind, copyright protection should be recognised. Wikimedia would in my humble opinion need to find other grounds for arguing a right to publish. Look forward to hearing the result from the illustrious courthouse. PS Please get the record and don’t let it get burnt …! We’ll surely have to see what the courts make of this. I can accept an ownership interest in the image by the photographer — but am not so sure about a copyright interest. I completely agree with Diana and Dave. The photos would not exist without the human, nor would paintings by animals. These things exist as a result of human endeavor. If we’re to give full credit to the animals, then THEY TOO need to be protected under copyright laws. Is that gonna happen? I doubt it! Additonally, I don’t think the photo shoot and painting sessions are even analogous. In the case of painting, the animal is at least aware of creating something. In the case of the macaque photo session, the macaque had no idea anything was being created. He was not bringing any creativity to the session, while the photographer arrived on site with the intention of creating macaque photos, invested financially in equipment and travel to do so, owned the equipment which the macaque commenced using without provocation, and the photographer brought his own creativity to bear when he allowed the macaque to continue clicking. It seems to me that, in all kinds of art, the artist begins a project and then lets the creation process happen, and the photographer used his judgment to do so here. The amount of effort involved (“sweat of the brow”) isn’t a factor: only the originality and creativity. I doubt it — not any time soon, for sure. Oh, God, please don’t let PETA hear about this!